[1000 STEEM BOUNTY] Design Badges for the Utopian Indiegogo CampaignsteemCreated with Sketch. As previously announced, Utopian will be running a crowdfunding campaign on Indiegogo with the goal of completing and releasing a public beta of Utopian Colony, the next generation of inclusive open source collaboration. In the past weeks, the team has been working tirelessly on what we aim to be the most successful crowdfunding campaign for a Steem dApp. Of course, we want you to take an active part in making it and exceed our expectations. This task request, aimed at graphic designers and illustrators, gives the artists of Utopian and the Steem blockchain an opportunity to leave an enduring mark on the campaign and Utopian Colony, as well as a chance to win a STEEM bounty. One of the features being developed for Utopian Colony is a system of unique badges that users and projects can earn or be awarded. The Utopian Badges will be a fun way to show your reputation as an open source contributor, and display achievements earned through activities on the platform. In addition to badges you will be able to earn or gift, we want to offer our Indiegogo supporters unique badges to display on their profile on Utopian Colony. These rare and unique badges will be limited in number, and will include the Steem handle of the artist who designed them. The Badges for our Indiegogo supporters are split into 2 types (Supporter and Project) and 3 tiers ranked in value that is visualized through frame and “gem” colors. 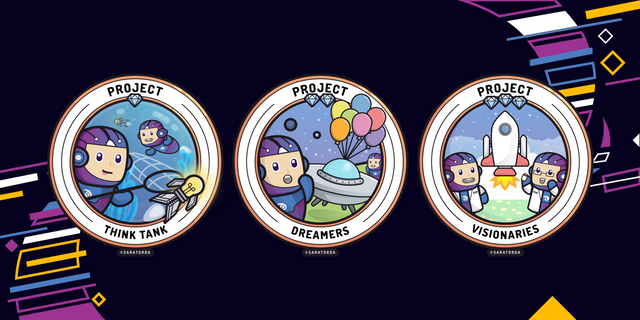 For the Project tiers, we invite YOU to stretch your creative muscles and come up with the names for these group badges that would also look great with an illustration. Good examples are think tank, dreamers, visionaries, inventors, pioneers, founders, etc. Be sure to stick to the general brand voice and style of the futuristic space colonization theme, and make sure the progression in tiers is logical. To give you a clear direction and examples, we’ve been collaborating with awesome illustrator @saratorda, whose badge designs you can see below. You can choose to submit either 3 or 6 badges, picking one or both of the types (Supporter and Project). Please include no more than 6 badges in total for your contribution. Make sure to use the provided components for the badges, including our mascot Utopy (in any position or theme), the frame, the gems (as indicated in the table below), and don’t forget include your Steem username as the bottom signature. Once you feel comfortable with your work, upload it as an Utopian contribution, according to our contribution submission guidelines, including all project source files. Your work will be reviewed and scored by the Utopian Review team, which will also grant you a @utopian-io upvote on your contribution post according to its score. Submission is limited to one contribution post per user. This post must contain all your designed badges and illustrations, as well as source files. Do not use copyrighted or licensed images in your illustrations. This task request will be run as a bounty. The top 3 designers, as chosen by the Utopian executive team, will be awarded with the 1000 STEEM prize. To participate, please publish your contribution via Utopian before 00:00 UTC February 28th. The results and names of the winners will be published by March 6th. Update: The deadline has been extended until 10th of March. Results will be published by 14th of March. ⚡$$$ Tipped @utopian.tasks ⚡100.00000000 SWIFT! If you don't know how I work, reply help! Currently the price of SwiftCash in the market is $0.0039 USD per SWIFT. Current value of the tip is $0.3900 USD. To find out more about SwiftCash, please read our whitepaper! Of course I would be glad to spread all the "gossips" related to this campaign to all social media accounts I have. el tren de las oportunidades solo pasa una vez "PARA TODOS LOS DISEÑADORES"
Good opportunity for all. Thanks for this post. Wow i like it!!! nice !!! love the badages!! Great Opportunity of all designers out there. Huge prize - good luck designers!